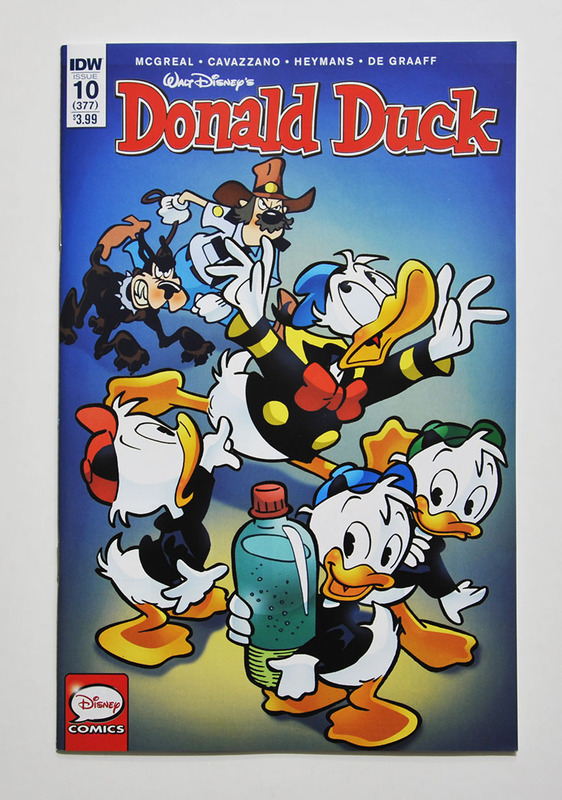 In sale right now is Donald Duck #377 (IDW’s #10) with the story "Bad Day at Black Water". From an untitled WDCS #155 story and "Fishy Warden"
"Flight WDCS-728" is of course a joke referring to the current title and issue number, and I guess "arriving at gate 2-016" is February 2016 or just 2016. Why it’s arriving from Toronto, Canada I don’t know (the comic is printed in Korea, IDW offices is in San Diego and the translator is USA based too I think). 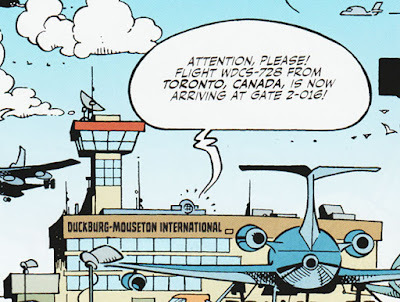 Also note that Duckburg and Mouseton apparently share the same airport. Anyway, this hidden reference got me thinking that the "Bad Day at Black Water" started with some reference too. 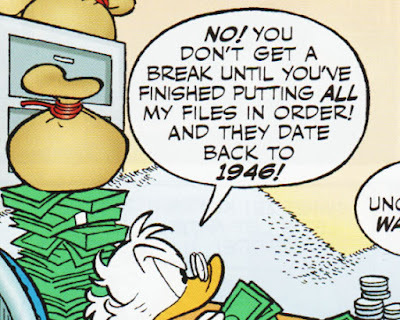 When Scrooge says his files date back to 1946, I started wondering if that specific year was put in by purpose. My first thought went to Scrooges first appearances in "Christmas on Bear Mountain". According to the bibliography in Michael Barrier’s book "Carl Barks and the Art of the Comic Book", the creation date for "Christmas on Bear Mountain" is July 22, 1947. This date comes from a list Barks himself compiled, and for this story the date it’s from the voucher Barks received from Western, i.e. the date they accepted his story. So work on the story was done sometime before that, maybe as early as 1946. But we don’t know that for sure, do we? I might of course be overthinking everything and 1946 is just a random date. Alright, I’m not going to go into reviewing this story, I don’t think I have that much to say about it really. But I did like it, even if the ending was a little boring after an exciting buildup. It’s worth checking out if you like Duck comics. I have a couple of more things to note about the story though. 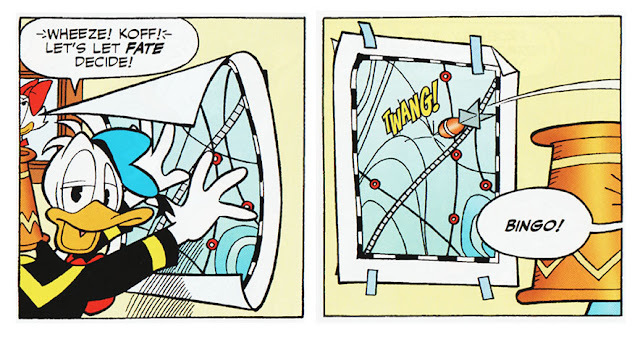 I like the fact that IDW make sure clothes and recurring objects are colored the same way in every story. Even when they use the coloring done by other publishers small adjustments are made. This story uses the Disney Italia coloring and one of the things that have been adjusted is the color on Donald’s car. But one little slip-up was made this time. The car is all red in all panels except one, where the Italian red-blue coloring is still used. If you’ve read the story you might have noticed the story code I-D 2011-014. 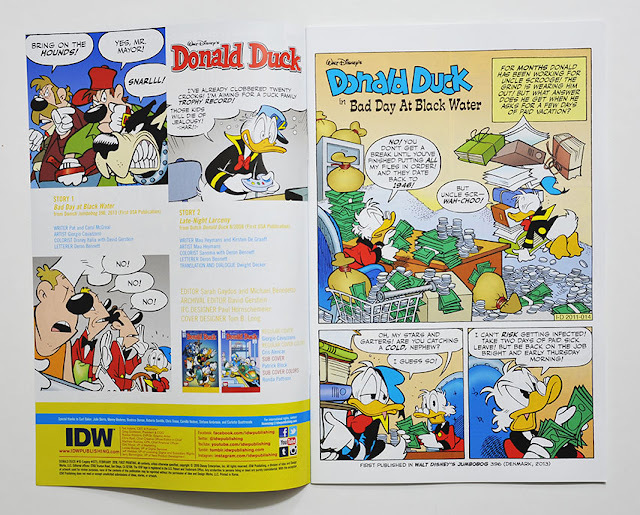 The I-D (or I/D) codes were stories made by Egmont Creative and Disney Italia in cooperation. Searching in inducks we can see that a number of these stories were made, but this is the first one published in the USA. From the list it looks like they stopped the coproduction in 2012, after just a few years. At least this kind of coding stopped then.